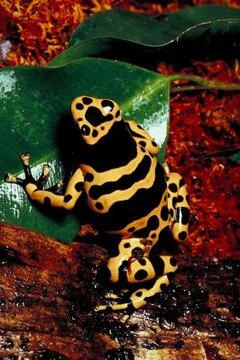 Bumblebee poison dart frogs (Dendrobates leucomelas), also frequently referred to as yellow-banded poison dart frogs, are amphibians that feature noteworthy black and yellow banding. These poison dart frogs are part of the family Dendrobatidae. Although they are poisonous in their natural habitats due to certain bugs they feed on, they are harmless in captive settings. Bumblebee poison dart frogs are prevalent in their native hunting grounds, specifically South America's Venezuela, Brazil, Guyana and Colombia. Numbers of the species are consistent and not threatened. They are drawn to damp and soggy settings and spend a lot of time in heaps of foliage, over rocks and below logs. Bumblebee poison dart frogs tend to grow to between 1 and 1.5 inches long. They are often bigger than other species of poison dart frogs. The males of this species are usually smaller than the females. In captive environments such as homes and zoos, poison dart frogs tend to live anywhere from 10 to 15 years. The record longevity for a poison dart frog was achieved by one individual who made it to an impressive 20.5 years in age. Poison dart frogs generally have briefer lifespans in the wild than ones in captivity, usually surviving anywhere from 5 to 7 years, notes Animal Diversity Web of the University of Michigan. If you have a poison dart frog in captivity, increase his chances of living a long life by touching him as little as possible. Physical contact is OK briefly -- say for the couple of seconds required for transporting your pet from point A to nearby point B. These diminutive frogs possess extremely fragile skin, and touching them extensively can bring upon potentially adverse health effects, warns Patrick Nabors of ReptileChannel.com. A variety of different components are potentially risky for the lives of bumblebee poison dart frogs in the wild -- namely a few kinds of habitat problems. Some things that can affect the lives of bumblebee poison dart frogs are fires, timber harvesting and farming development. Despite their poisonous protective mechanism in the wild, they occasionally are subject to the dangers of predators, such as certain snakes.